Feel the rhythm and beat of the city on the new ER-6n. Contemporary styling and a reputation as the definitive urban thrill seeker make the ER-6n first choice for a range of riders from those new to the world of biking to experienced two-wheel fans. 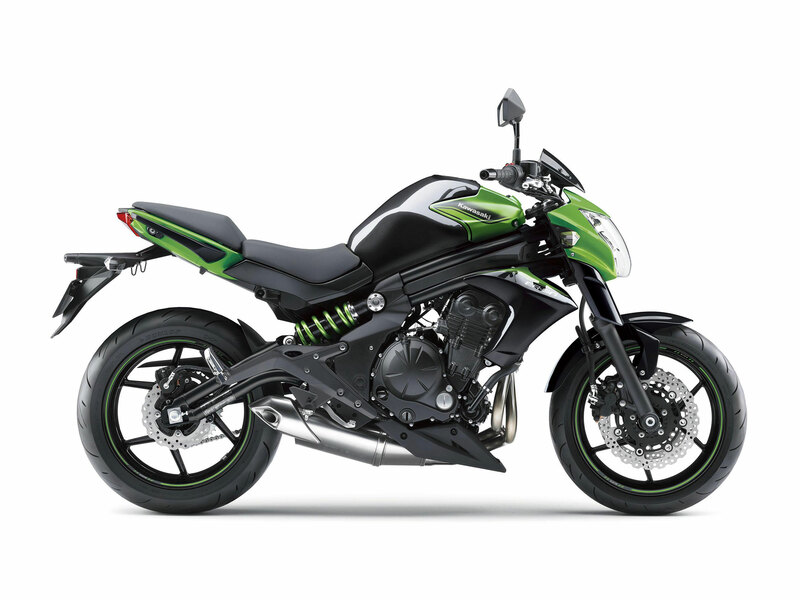 Experience the true city beat with the Kawasaki ER-6n. Like on its predecessor, the all-new double-pipe perimeter-style frame is a key component of the ER-6n’s identity. As before, the new bodywork accentuates the frame, rather than hiding it. The double-pipe design of the new frame, made from high-tensile steel, contributes to the bike’s lightweight appearance. More compact headlamp shroud is shorter front to back, and designed to make it look slimmer vertically as well – an image reinforced by the smoked instrument visor. Angular design of the stacked dual headlamp helps maintain the identity of the ER-6n while contributing to the sharp new street-fighter style looks. The fuel tank is 20 mm taller, helping to visually concentrate the ER-6n’s mass at the front of the bike. The rear of the tank slopes back in a straight line to the seat. The ER-6n’s Parallel Twin engine configuration was chosen as the best balance of good power characteristics and compact size. Engine tuning delivered both a rider-friendly character ideal for new riders and performance to put a smile on the faces of more experienced motorcyclists. The engine’s compact size was one of the keys to realising the ER-6n’s slim package. The 2012 engine offers more low-mid range torque for more fun and greater usability in everyday riding situations, while maintaining the smooth, high-revving character of its predecessor. 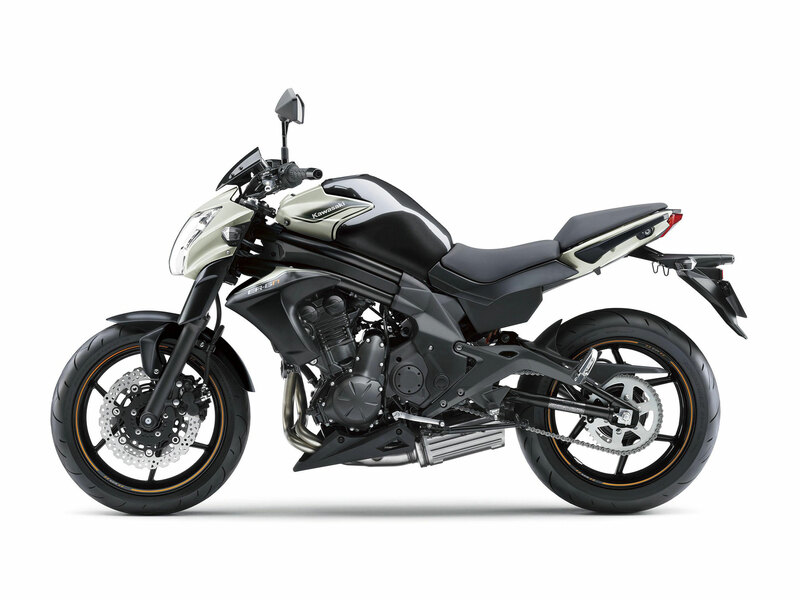 The rigidity balance of the double-pipe frame and swingarm contributes to a lighter, easier handling. Rigid-mount engine is contributing to the frame’s idealised rigidity balance. The swingarm’s new double-pipe design is for optimal rigidity. Revised suspension offering both sporty handling and enhanced comfort. Sporty looking tandem seat with thick cushioning ensures good passenger comfort. Ergonomic passenger grips are positioned to make them easy for tandem riders to grab. Good passenger confidence makes it easier for riders when carrying a pillion. Seat bracket is rubber-mounted at the front to reduced vibration transferred through the seat. Under-engine muffler with larger volume and revised internal construction delivers increased torque in the everyday range below 7,000 rpm. The increased performance facilitates control at lower rpm and contributes to the enhanced enjoyment of the new ER-6n. Following the lines of the frame and rear shock, the swingarm also features the new double-pipe design, complementing the design of the frame and contributing to the ER-6n’s high-quality appearance. 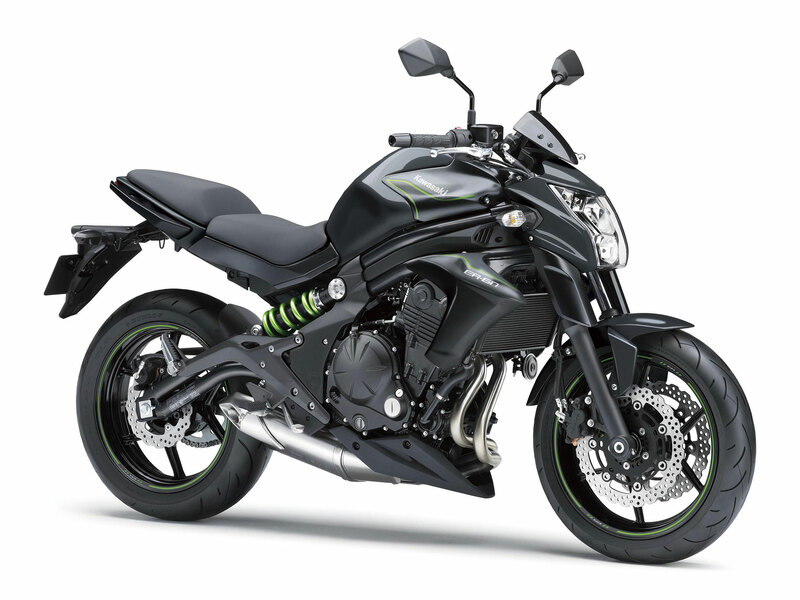 The swingarm’s gull-arm style design on the right side enables the more aggressive angle of the muffler. To enable the more compact front area, the instrument cluster was moved as far back as possible. It is mounted above the handlebar. A stacked instrument cluster features an easier-to-read layout and an analogue-style tachometer uses white LED backlights for excellent visibility at night. The multi-function LCD screen has blue backlighting. In addition to the fuel gauge, digital speedometer, clock, odometer and dual trip meters, new features include: remaining range, average/instant fuel consumption and the Economical Riding Indicator. Raised tick marks on the tachometer dial face, a bubble lens and elevated instrument frame construction contribute to the instrumentation’s greater legibility as well as a high-quality image. Revised shrouds are narrower when viewed from the front. Front turn signals, previously built-in to the shrouds, are mounted on the headlamp shroud. quality appearance. Sharper tail cowl is 10 mm shorter, helping to move volume away from the rear of the bike. A sharper new LED taillight contributes to the slimmer look. Intake ducts extend through the frame tubes to ensure a source of cool fresh air for the engine. This also contributes to the induction note, adding to rider excitement. The combination of efficient fuel injection and a 3-way catalyser inside the muffler result in low emissions. Revised muffler internal construction and catalyser layout ensure clean emissions that will pass stringent Euro-III regulations. An offset laydown rear single-shock suspension flows smoothly from the frame to the swingarm. Compact new ABS unit has a more advanced processor that enables more precise ABS control. Sudden over-application of the brakes, or braking on low-grip surfaces (surfaces with a low coefficient of friction) such as wet asphalt or manhole covers may cause a motorcycle’s wheel(s) to lock up and slip. ABS was developed to prevent such incidents. Kawasaki ABS systems are controlled by high precision and highly reliable programming formulated based on thorough testing of numerous riding situations. By ensuring stable braking performance, they offer rider reassurance that contributes to greater riding enjoyment. Like other Kawasaki engine management technology, Dual Throttle Valves were designed with the philosophy of “following the rider’s intention, while providing natural-feeling support.” They are featured on many Kawasaki models. Using high-precision electronic control for engine management, Kawasaki models can achieve a high level of fuel efficiency. 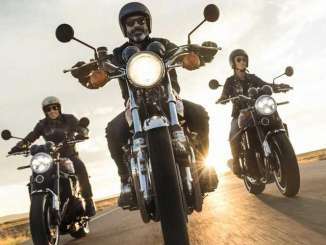 However, fuel consumption is greatly affected by throttle use, gear selection, and other elements under the rider’s control. The Economical Riding Indicator is a function that indicates when current riding conditions are consuming a low amount of fuel. The system continuously monitors fuel consumption, regardless of vehicle speed, engine speed, throttle position and other riding conditions. When fuel consumption is low for a given speed (i.e. fuel efficiency is high), an “ECO” mark appears on the instrument panel’s LCD screen. By riding so that the “ECO” mark remains on, fuel consumption can be reduced. While effective vehicle speed and engine speed may vary by model, paying attention to conditions that cause the “ECO” mark to appear can help riders improve their fuel efficiency – a handy way to increase cruising range. Further, keeping fuel consumption low also helps minimise negative impact on the environment.